Ewald's Venus Ford is the one stop you will ever need to make for your automotive needs! Ewald's Venus Ford provides much more than high quality cars for sale at affordable prices, as our dealership also provides and offers customers with many other services, such as full vehicle maintenance and collision repair, and even a great selection of new in Milwaukee. Ewald's Venus Ford offers customers a wide selection of Ford Accessories for sale, and many Venus Coupons are available for these Ford Accessories and services! Ford Accessories like interior lighting kits, Splash Guards, and even Air Deflectors are all Ford Accessories that Ewald's Venus Ford Supplies! Come and check out some of the fantastic services and the Venus Coupons we offer for them today! 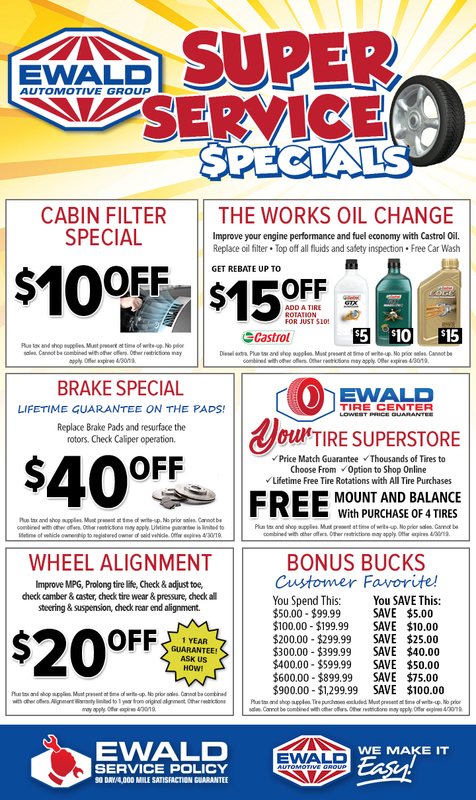 Our Venus Coupons help customers save money on many things here with Ewald's Venus Ford, such as Venus Coupons for things such as Brake Pad Replacements, or for new tired in Milwaukee, and even for general maintenance like lube and oil changes! No matter what kind of automotive service or maintenance you are looking for, Ewald's Venus Store will surely be able to help you with your auto needs, and will most likely have an excellent Venus Coupon to help you save some money! So come on in to Ewald's Venus Ford today and check out the awesome Ford Accessories, Venus Coupons, and the awesome services that we provide for you today! For more information on our Venus Coupons Click the link or come in to our location at 2727 E Layton Ave. Cudahy, WI 53110 today to have your vehicle serviced today!